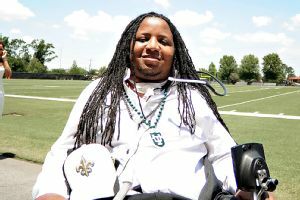 Many football fans in Louisiana and across the nation will remember hearing the news of Devon Walker, star safety for the Tulane Wave, colliding with a teammate in September of 2012. The injury left Walker paralyzed and confined to a wheelchair. The injury ended a promising football career of an exciting player who seemed destined to one day be a contributing part of pro football organization. At a press conference shortly after Tulane’s graduation ceremonies, where Walker received a degree in cell and molecular biology, New Orleans Saints coach Sean Payton announced that the team it had signed the former stand-out. Apparently, Walker was unaware he was about to become a Saint and thought his family was taking him to eat oysters after graduation. Instead, the destination was the Saints’ rookie mini-camp press conference. “I’m proud to be up here with him, and I’m super proud of his recovery… they way he’s handled this and the way he’s approached this,” Payton stated. Area high school football fans may remember seeing Walker in action when he starred at Destrahan a few years back, leading them to a state championship over West Monroe in 2008.